Sky & Telescope vs Astronomy Magazine: Which is Best? There are four strong astronomy magazines available today (see table below), but Astronomy and Sky & Telescope Magazines are the two biggest - which is why we've put them head to head in this article. Two of the best sources of information for amateur astronomers are Astronomy Magazine and Sky & Telescope Magazine. These magazines both contain lots of sumptuous images of the night sky (you can learn how to take photos of stars at night for yourself) and useful astronomy information but, these are quite different beasts and we thought it might be helpful to compare and contrast them to find which is the best one for backyard stargazers. 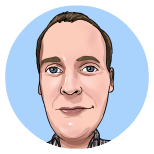 In particular, we'll compare and contrast their monthly observation guides, stand-alone feature articles and product reviews. The first edition of Astronomy Magazine was published back in August 1973. ​It's the world's biggest selling astronomy magazine, with a circulation of over 114,000, compared to 80,000 for Sky & Telescope Magazine. 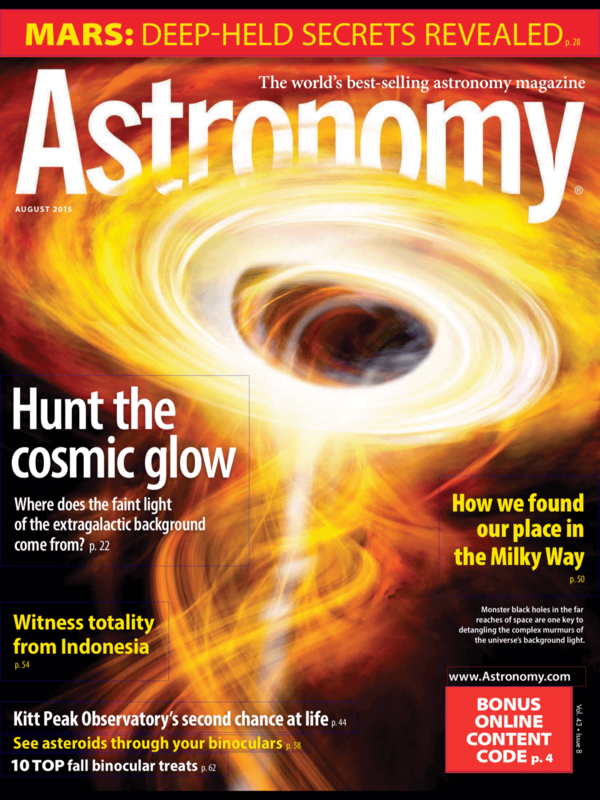 The August edition of Astronomy Magazine had 79 pages of content split into 7 articles (plus one equipment test article), 5 'columns'​, and a number of regular pieces, such as Q&A, Letter from the Editor and Reader Gallery. The cover price for Astronomy Magazine at the time of writing is ​$5.99, but there's a substantial discount if you click on this link to subscribe for a year. Although not as big as Astronomy Magazine, Sky & Telescope is much older, being founded in 1941. It is edited almost entirely by amateur and professional astronomers. which makes it a compelling choice for amateur astronomers across the country. 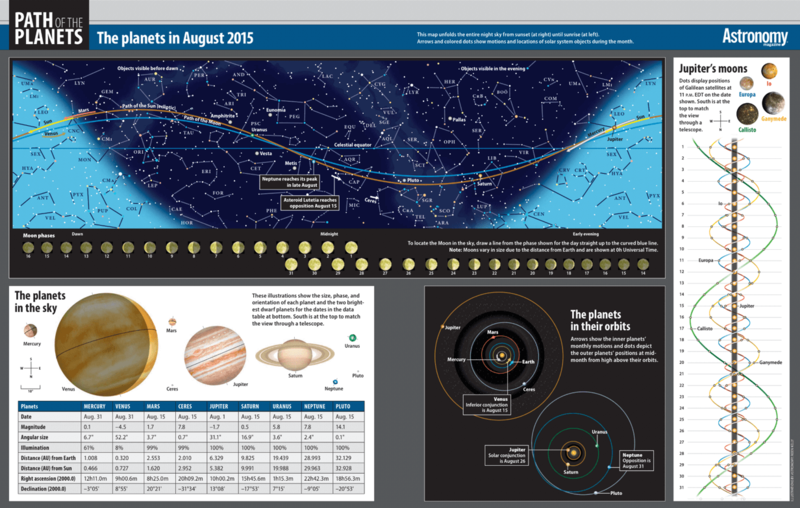 The August edition of S&T is slightly larger that Astronomy Magazine, coming in at 84 pages. Their content is split into four articles (although one of these, on the 'crises for Kitt Peak Observatories' is 13 pages long covering 3 different-but-linked stories), 16 pages of sky observing features, a product test and 9 regular sections, including telescope workshop and book review. The cover price of Sky & Telescope Magazine is at the time of writing is also $5.99 per month, but you'll get a big discount on that (almost half price when I last looked) by clicking this link for an annual subscription. We'll start this review of astronomy magazines with how each publication covers off what's happening in the night sky. There are eight pages in the August edition of Astronomy Magazine aimed at helping readers get the most out of August's night sky. Half of this section is given over to commentary of the month's night sky viewing opportunities, two pages at the start and another two at the end. The overview topic for this month is the Perseid meteor shower. As you'd expect, there is a thorough 'when and ​how' to view each of the planets and the moon. This month, it includes a small finder chart for catching a glimpse of Pluto to coincide with the iconic New Horizons flypast. This chart on a double page spread shows exactly where each of the planets can be found against the night sky. Following the line of the ecliptic, you can see when each planet is visible, e.g. sunset / night / dawn, or if it's not visible at all because it's only above the horizon in the day. In addition, there's full data for all the planets (plus Pluto and Ceres), such as magnitude, size and distance. It even shows how they will look through 'a' telescope - but that's generic and may be better or worse than your own scope. The observing section in Sky & Telescope magazine is a step apart from Astronomy Magazine's. At 15 pages (plus, in this month's episode, an additional 6-page special on summer stars) it pretty much doubles the observing content of its more popular counterpart. There is a picture of the path of the planets (and separately, where Jupiter's moons are on each day) but it isn't as well designed and compelling as that in Astronomy Magazine. 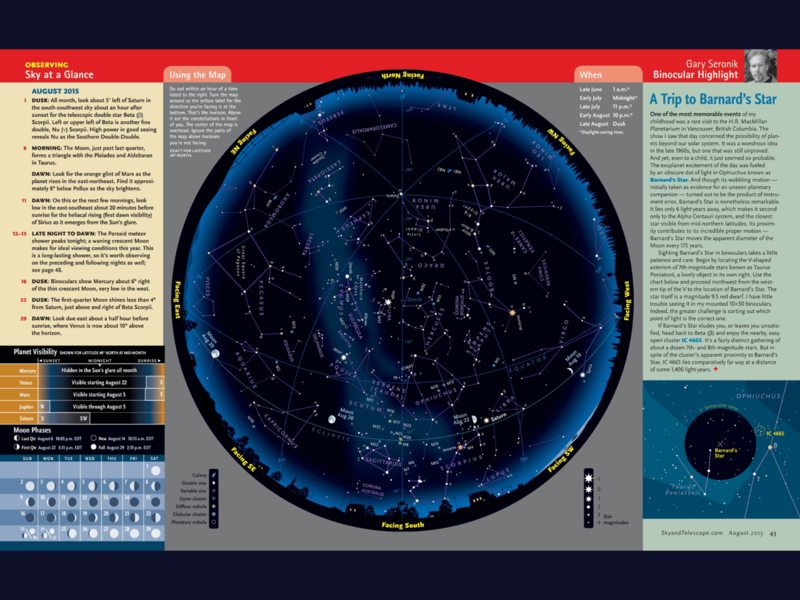 There is also a 'Sky at a Glance' star guide (see picture) which is a double page spread with highlights to look out for through the month. It's in the additional content where Sky & Telescope really hits the mark for the backyard telescope (and binocular) user. ​In their Celestial Calendar section, they also cover the Perseids really well: how to observe, best time, counting what you see and some really great background information on the shower and why this year should be one of the best (into the trail of where the comet that created the shower was last seen and a new moon). ​But, they also have a full page on Chi Cygni, a star in the northern cross with a fascinating variation in its brightness over a year and details on how and when to observe it for the full effect... you'll want to point your scope in its direction when you read it! On top of all that, there are two pages on observing the moon, and another two pages about seasonally relevant Deep-Sky Wonders. For August, S&T are talking about the shield of Scutum and and the half dozen faint surprises ​this tiny constellation holds for the deep sky enthusiast, including IC1295, this beautifully delicate planetary nebula. What's best about all of this content is it's written by people who are clearly enthusiastic and actually do the observing themselves. For example, Sue French, writing about the deep sky objects says "The cluster is quite pretty in my 10-inch reflector at 213x..."​ which gives loads of confidence in her, and will make you want to get outside and try to copy her! There are some distinct similarities between Astronomy Magazine and Sky & Telescope Magazine when it comes to their monthly observing articles. And, of course, there would be - they are both talking about the same night sky at the same time of year. But, in terms of a 'winner'... well, it has to be Sky & Telescope Magazine. Loads of content, focussing on areas of intense interest to different astronomers each month (moon, planets, deep sky) and then some really comprehensive and interesting stand-alone pieces. What really wins out though is S&T's writing. Feature articles are the special pieces written uniquely for a particular issue. In the August issues of AM and S&TM, there were eleven in total, split 7 in AM and four in Sky & Telescope. They both had pieces about high peak observatories under budget threats, and other articles included binocular astronomy, observing a total solar eclipse, the VJ Day kiss and astrophotography. 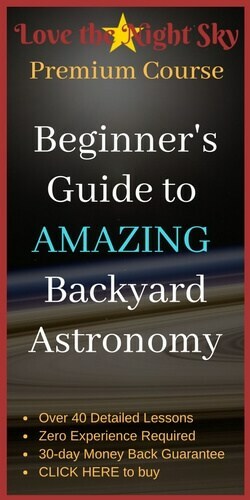 In this section, we'll take a look at the style of these and discover which provides best value for an amateur astronomer. 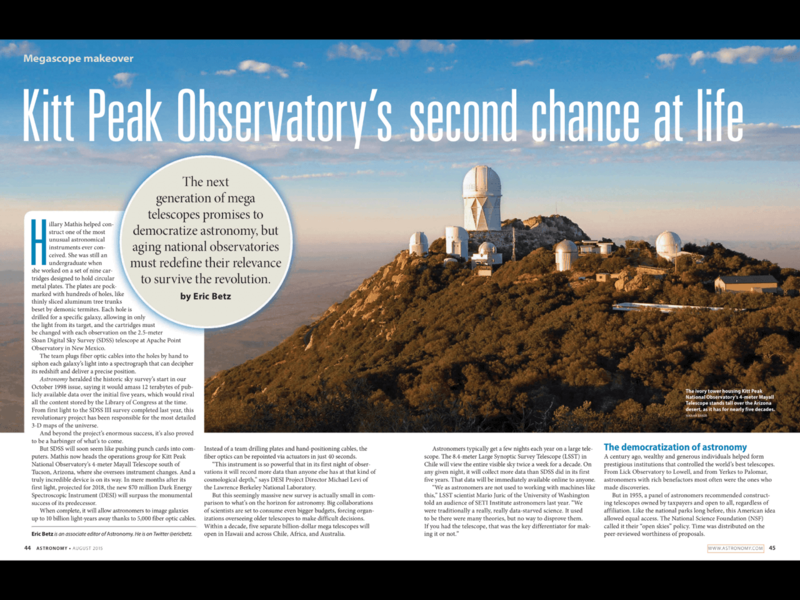 The 'centre spread' this month is an article into the future use of the older telescopes at the Kitt Peak observatory. It is a well written and interesting article but... it's a world away from the concerns of the backyard astronomer. Searching for the Universe's ​Background Glow by Liz Kruesi tells the intricate story of trying to account for the amount of light energy in the universe. AM's six pages on our fascination with Mars was a much easier read! Jim Bell does a great job of mashing together some amazing photographs with insight from the seven operational landers on the surface of the enigmatic planet​. He then sums up the aspirations of five more planned missions. ​For all of this, as Jim notes at the close of his brilliant piece, we still do not know whether Mars is, or has ever been, inhabited. That will be the focus of investigation for future missions. There are three features very squarely aimed at the amateur astronomer, one about the total solar eclipse coming in Indonesia, and two on binocular astronomy. The two binocular articles go into detail on '10 Night Sky Treats for Fall' and 'Asteroid Spotting'. The fall treats is certainly the most usable of the articles for the amateur! It covers globular clusters, the quadruple(!) star 15 Cephei​, a couple of asterisms and the spiral galaxy M74. They don't round it all up nearly as well as Sky and Telescope Magazine do in their similar article (see below)​, and the objects might not fill you with the same desire to go and find them... but that might just be a telescopes v. binoculars thing? Talking of which, the final feature piece in AM is about asteroid hunting with bin's. This is a much more useful article. It provides a list of the brightest asteroids to hunt for (there are about 25 below magnitude 10, i.e. within range of decent binoculars) ​and a guide to spotting them - which is helped by referring to here and here. There are fewer feature articles in Sky & Telescope Magazine because it chooses to devote more space to observation articles. Whilst they are both well written and come from different perspectives (S&TM spends more time talking about the history) neither gives much other than a general interest to the amateur. ​Winning the prize for the most bizarre article across both magazines is the six pages devoted to detective work by astronomers to pinpoint the exact moment this picture was taken. 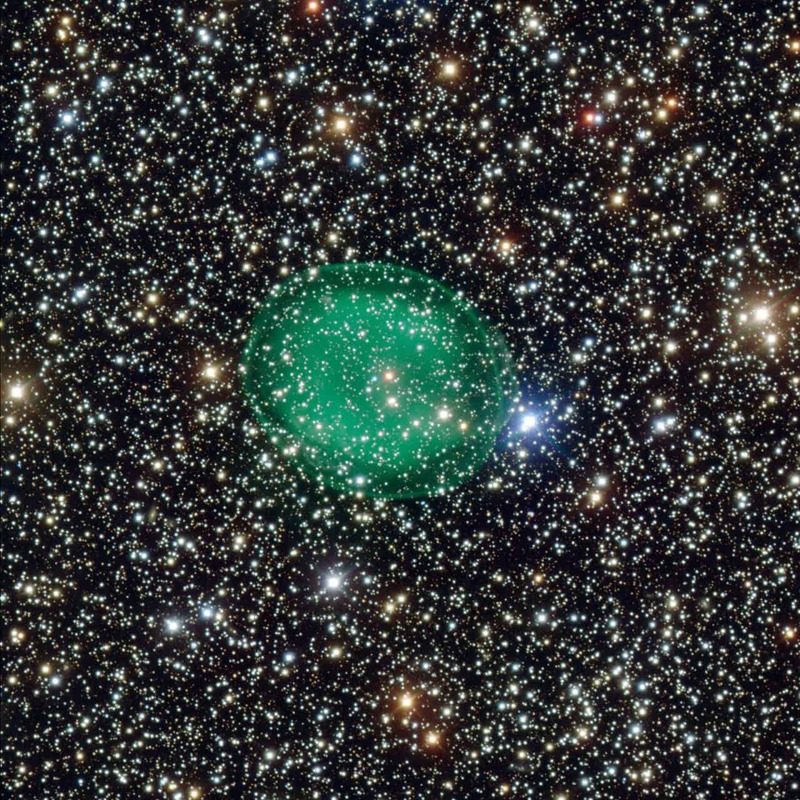 Like us, you may not be sure why it was included in an astronomy magazine, but it was interesting nonetheless. Sky & Telescope makes amends for that distraction with six pages dedicated to observing the summer night's skies. Tony Flanders, ​a dedicated astronomer of over twenty years, talks passionately about the best objects we can find on the less-than-black nights of summer. Covering off 11 different clusters and interesting stars, ​along with a finder chart, this is the kind of article that you can do something practical with. The magazine then moves straight into its final feature of the month - 'Armchair Imaging', written by Damian Peach. Damian - a world-class imager of the planets - writes about how it is possible to get remote access to some phenomenal dark-sky telescopes around the U.S., with Europe and Australia to follow. We really enjoyed 'researching' this post by reading through the best astronomy journalism available today. The prize for best amateur astronomy magazine has to be awarded to Sky & Telescope magazine. 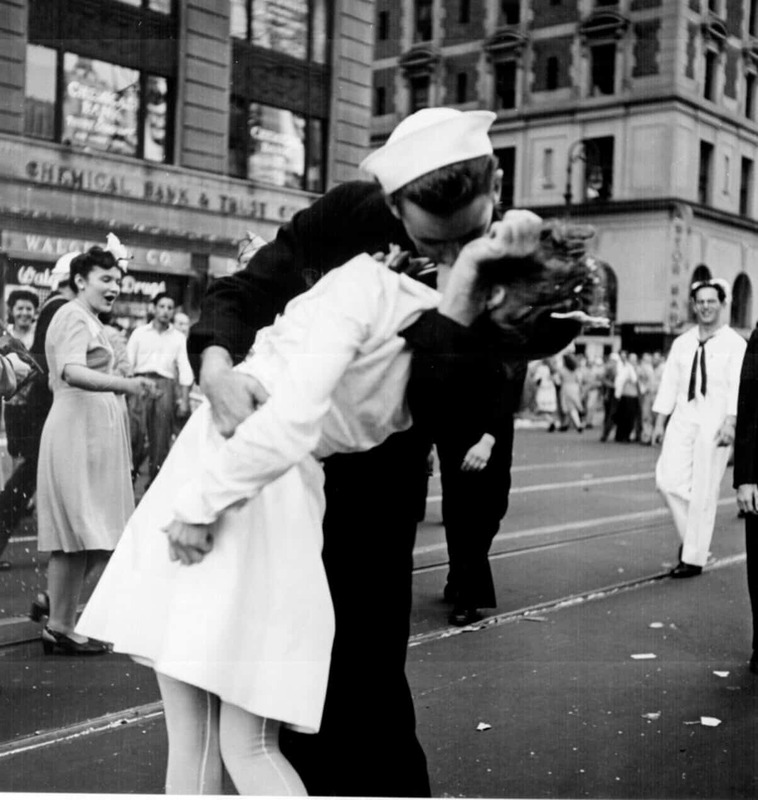 Leaving aside the VJ Day Kiss article, everything else was written by a well informed, experienced and passionate astronomer, which comes across very clearly in the writing. The feature articles are there to serve a wider purpose: to give us all detailed background into the bigger issues affecting astronomy that could well percolate down over time to impact the backyard observer. Both magazines had pieces that were directionally actionable, but the best of these was in Sky & Telescope magazine. Although we've focussed on the two most popular astronomy magazines in this article, there are a few more to choose from. If you've read the whole of this article, you won't be surprised to learn that our favourite magazine for astronomers is Sky & Telescope Magazine. Their style feels more relevant for amateur astronomers. They don't try to jazz things up or come across as really slick, and we like that a lot. The journalists are passionate star-gazers themselves who ​have taken time and made effort to share their enthusiasm with us. 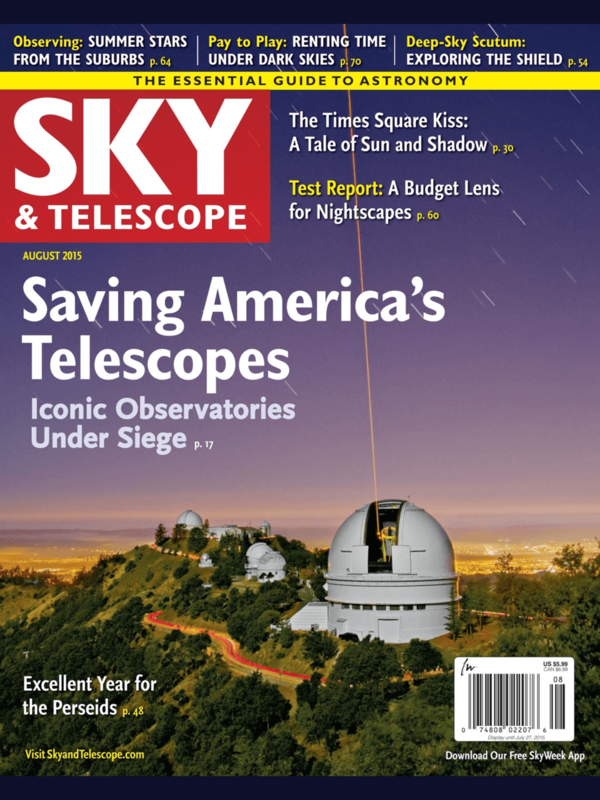 We strongly recommend a Sky & Telescope Magazine subscription!​ You will not be disappointed!